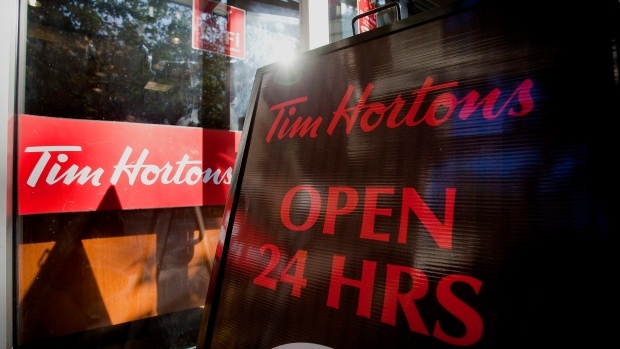 Tim Hortons and an association representing some of its frustrated franchisees are close to reaching a settlement in two class-action lawsuits the group filed against the coffee-and-doughnut chain. Tim Hortons and the Great White North Franchisee Association submitted a term sheet signed by their respective legal counsel to justice Edward Morgan at the Ontario Superior Court of Justice Wednesday. "I think both parties, we've worked really hard to reach this point and I think that it's going to be positive for the Tim Hortons brand moving forward and for our guests and for Tim Horton franchisees," said Mark Walker, the GWNFA's president. The three-page document, which comes after weeks of negotiations between the two parties, is non-binding, but outlines the key points to a future settlement in the two cases. The first lawsuit, filed in June 2017, alleged Restaurant Brands International, the parent company of Tim Hortons, improperly used funds from a national advertising fund. It sought $500 million in damages. RBI denied the allegations and they have not been proven in court. The second lawsuit, filed in Oct. 2017, alleged RBI subverted the franchisees' right to associate by denying future store opportunities to franchisees "not aligned" with the chain's interest, for example, or setting aside a $2-billion fund to buy out the GWNFA's current and future members. RBI also denied these allegations and they were also not proven in court. The key terms of a future settlement address some of these concerns, said Walker and a source familiar with the case. The parties agree that the coffee chain's elected advisory board remains the only organization that represents the franchisees' interest. Though, that does not mean the dissolution of the GWNFA, which Walker said will continue to serve its membership and help franchisees in whichever way it can. The term paper states Tim Hortons has not interfered with any franchisee who joins or participates in an association, and will not do so in the future. Tim Hortons will shorten members' terms from four years to three and will shift to electronic voting. Previously, only franchisees who attended the chain's convention could cast a ballot. Additionally, four members of the advisory board will review substantial details of the advertising fund spending at least four times a year in an apparent effort to increase transparency of the disputed monies. Walker also reviewed a summary of the fund's spending from 2015-17 and said he received satisfactory answers to questions he had. Tim Hortons will also pay $5 million a year for two years to boost local and regional marketing budgets. Local regions will determine how to use those funds. The chain will also pay $2 million to the GWNFA's law firm, Toronto-based Himelfarb Proszanski. The move came as the GWNFA had a hearing in court for the judge to rule on whether a third party company could help fund their suit. The judge will rule on the term sheet, hopefully Thursday, said Walker. The two parties will then continue negotiating details and aim to bring an agreement to the judge on March 21, said the source. That agreement would then be sent to every Canadian franchisee, who will have four weeks to accept or reject the terms. The judge will hold another hearing on April 26 when any dissenting franchisees will have their voices heard and make a final ruling on the settlement. The company has spent the last year working closely with its restaurant owners, said Alex Macedo, the chain's president, in a statement. "These lawsuits and previous public disagreements with some restaurant owners don't reflect how positive our relationship is today and all the progress we have made together to focus on building the business," he said. "It became obvious to all of us that we need to put these lawsuits behind us and focus on what Canadians care about -- great coffee, great food and great support for our communities across Canada."